Our Free Spirit Club fat quarter pack has recently been sent out and the fabrics by the metre can now be purchased. The new fabrics are called Fresh Cut and as ever with Free Spirit are bold, bright and cheerful and bound to add a zing to your step after the downpours of this week. Apologies to those who haven't been under the deluge. We also have some new fabrics for our Hoffman Club and the Forever Green range provides co-ordinates of subtle greens with foliage designs. Apologies for it being so long for an update on new material at the Cotton Patch but I was out of the country for over a month and then when I came back we had the Malvern Quilt Show to organise and get ready for. 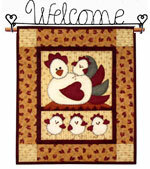 As a consequence though I have a bumper posting of new patchwork and quilting related books. I have added over twenty new titles and they cover a wide range of subjects. There are new titles from Suzanne McNeil who has been working with Design Originals to produce a number of quilt pattern books. 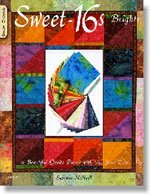 Charm Quilts and Sweet 16's are in the same format as the popular Strip Delight and Strip Crazy. In this case though they focus on precut 5" charms or 9" x 11" special collections sizes. 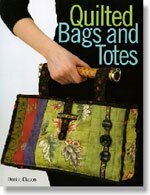 We have an excellent addition to our section on patchwork bags with Quilted Bags and Totes from Denise Clason. There are comprehensive instructions for making the bags with over 300 photos and illustrations alongside designs for 15 different styles of bag. 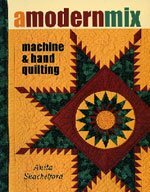 Anita Shackelford has some beautiful quilting in her new book "A Modern Mix: Machine and Hand Quilting". As she states in her introduction when she started quilting in the 1960's nearly every quilt was of a traditional style and was hand quilted. Anita now advocates a mixture of techniques, after all if you love quilting how many quilts can you finish by hand versus getting a machine to help you out. In her book she looks at ways that you can combine machine and hand quilting to create faster quilts.